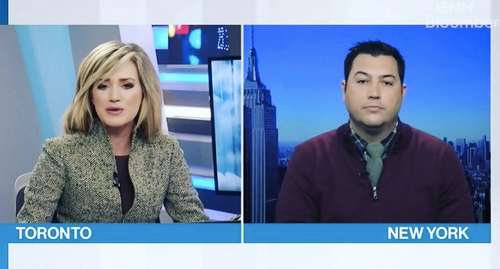 Today I want to share an interview I recently did with BNN Bloomberg where I talked about U.S. stocks, interest rates, and what credit spreads are suggesting for the overall risk-appetite of institutions. I write to you often, but I thought you’d enjoy hearing or seeing this conversation. What I’m telling the world about this bearish regime is the same thing I’m saying here and in Breakout Profits. JC: We’re not in an environment where we want to be buying dips and buying stocks. We continue to be in an environment where we want to be selling stocks and selling into rallies. That’s the regime we’re in. We’re not seeing breadth improvement with new lows in the indexes. We’re seeing expansion of downside participation. More markets around the world are making new lows. Momentum is showing bearish characteristics. More sectors and industry groups are breaking down. There’s an expansion of individual stocks participating to the downside. The new 52-week high list is non-existent. These are all characteristics of environments where we want to sell stocks, sell into strength, and not buy them. I think people may say, “Great, sell into a rally, but we’re not seeing a lot of rallies.” What do we do? JC: Again, that’s something that we don’t see in uptrends. For me, it’s very simple. We want to be selling strength. We’re positioned for exponentially more downside in stocks. At best, we get a 20% decline from high to low. We still have a long way to go. A 20% decline from these current levels, or from previous highs? We’re already down about 10% or so. JC: If we get down to $2,350 or so in the S&Ps, that’s 20%. In my opinion, there’s pretty good support there. Whether that support holds is anyone’s guess, but once we get down near those levels, we want to start to see positive momentum divergences, fewer stocks participating to the downside. In other words, breadth improvement. When you start to see breadth improvement near important levels like that, that’s a key bottom where we can position ourselves for the long side. But we’re nowhere near that. Any sectors that look reasonable right now where we won’t see a 20% drop? JC: On a relative basis, yes. Things like utilities and healthcare and consumer staples are showing out-performance. But those are characteristics of downtrending markets. Consumer staples are not leaders in uptrends. Financials, tech, and consumer discretionaries lead in uptrends. When stocks are getting shellacked, money flows into lower beta names. Do you believe that we will continue to see U.S. markets “catch down” with global markets? JC: Yes, that’s what we’re seeing. At one point in late September, the U.S. indexes represented 120% of the year-to-date gain in the world indexes. It was America, and everybody else was down. The question was, ‘Are we going to get rotation into emerging markets into Europe and things like that and everything is fine, or is the U.S. going to catch down?’ Clearly, it’s been the latter. Global markets are falling similar to how they were doing well in 2016 and 2017. What’s your intermediate- to longer-term outlook? JC: I don’t care what happened today or next year. Our sweet spot is looking out weeks and months. I’m trying to make money this quarter. I don’t even know what I’m having for dinner tonight let alone what the markets are going to do next year. We need to weigh the evidence that we have in front us. How bad can things get? Things can get really bad. But to suggest what’s that going to happen is to me a little bit irresponsible. We want to take it one step at a time. I think $2,350 is a good potential support level. At those levels, we’d want to be covering short positions, and also look be looking for breadth improvements. If they show up, that would be a solid catalyst to buy some stocks.